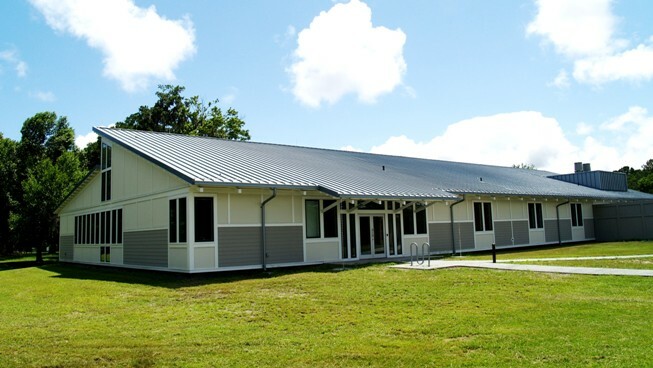 The Savannah Branch of the U.S. Green Building Council (USGBC) presented a LEED® Gold Certification plaque to the Marine and Coastal Science Research and Instructional Center (MCSRIC) at Skidaway Institute of Oceanography on Tuesday, October 19. 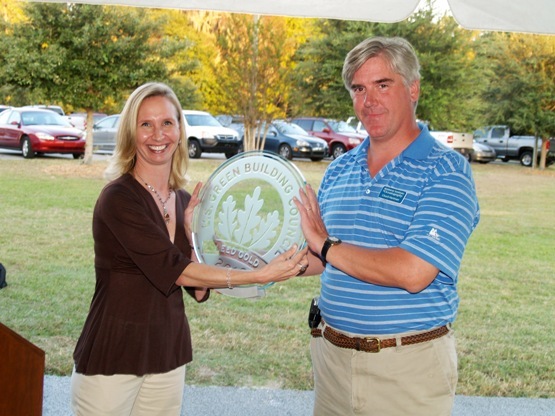 Denise Grabowski of the Savannah Chapter of the U.S. Green Building Council presents the LEED Gold Certification plaque to Skidaway Institute Plant Superintendent Chuck Hartman. Leadership in Energy & Environmental Design (LEED) is an internationally recognized green building certification system, providing third-party verification that a building or community was designed and built using strategies intended to improve performance in areas such as energy savings, water efficiency, CO2 emissions reduction, improved indoor environmental quality, and stewardship of resources and sensitivity to their impacts. Completed in mid-2009, the MCSRIC research and laboratory building was designed from the outset to be environmentally friendly. The building’s orientation minimizes its east-west exposure which reduces the heat it absorbs from the sun. This orientation is one reason the MCSRIC is 31 percent more energy efficient than a comparable building. Its courtyard, roof and sidewalks are organic or reflect the sun’s energy, further reducing the amount of heat the building will absorb. The MCSRIC contains 11,000 square-feet of state-of-the-art research laboratories and offices, space for visiting scientists, and instructional space for marine science students from throughout the University System of Georgia. It was funded with a $5 million dollar appropriation approved by the Georgia General Assembly in 2006 and signed by Governor Sonny Perdue. 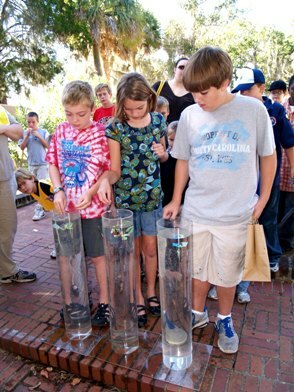 Skidaway Marine Science Day a success! 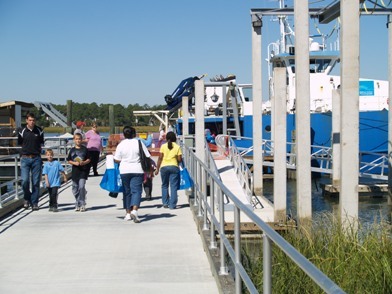 We had a beautiful day last Saturday as more than 1,900 visitors converged on our campus for our annual open house, Skidaway Marine Science Day. 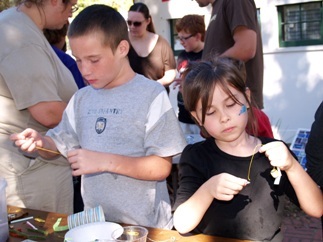 The event featured activities geared for all ages from young children to adults. 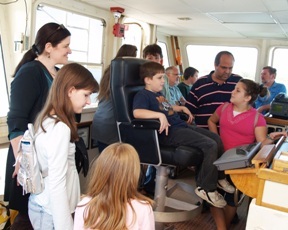 These included programs, tours, displays and hands-on activities, primarily related to marine science. Skidaway Marine Science Day was presented Skidaway Institute and our campus partners, including the University of Georgia (UGA) Marine Education Center and Aquarium, the UGA Shellfish Research Laboratory, Gray’s Reef National Marine Sanctuary and WSVH Georgia Public Radio. Visitors in the R/V Savannah's "dry lab." A crowd on "the bridge." 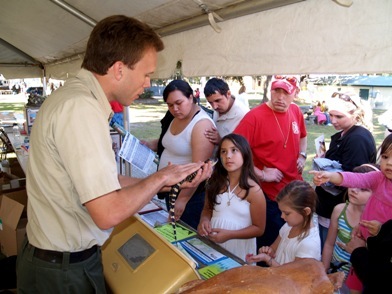 science displays and talks on current research programs; and hands-on science activities. 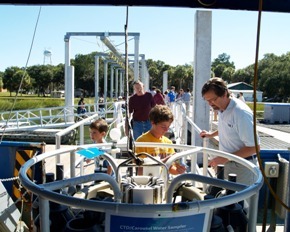 Charles Roberston explains a CTD array. Jay Brandes explains some of the science behind the Gulf oil spill. The UGA Marine Extension Service Aquarium was be open with no admission fee. 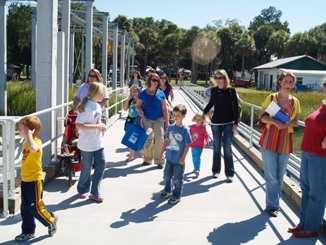 In addition, the aquarium education staff offered visitors a full afternoon of activities including science talks, a reptile show, boat tours, touch tanks, and behind-the-scene tours of the aquarium. 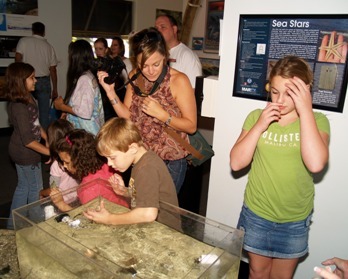 The aquarium touch tanks are always popular. 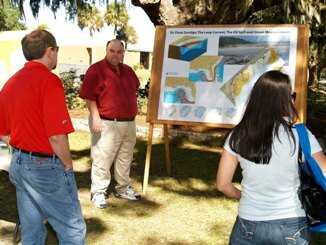 The UGA Shellfish Laboratory provided visitors with displays and information on marine life on the Georgia Coast. Bagging oyster shells for a good cause can actually be fun. 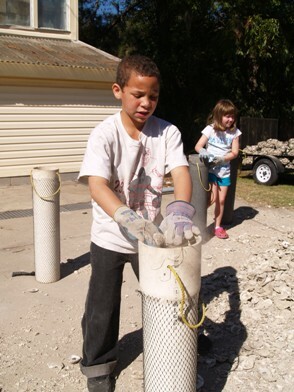 Children were given the opportunity to help protect the marine environment by bagging oyster shells used for oyster reef restoration projects. Driving ROVs in the pool. 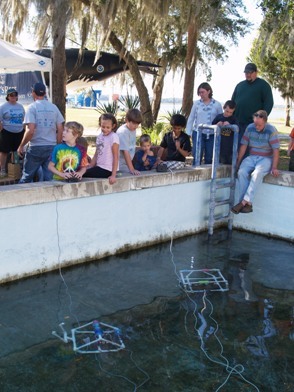 The staff of Gray’s Reef National Marine Sanctuary set up their remotely-operated-vehicle (ROV) in a swimming pool and teach visitors how to “drive” it and pick up objects from the bottom. WSVH Georgia Public Radio was open for visitors. Skidaway Institute professor Bill Savidge presented a special program, “The Seven Deadly Sins of Science Fair Projects,” aimed at parents and students involved in science fair projects. For the second year in a row, Skidaway Marine Science Day was also open to non-campus scientific and environmental groups. 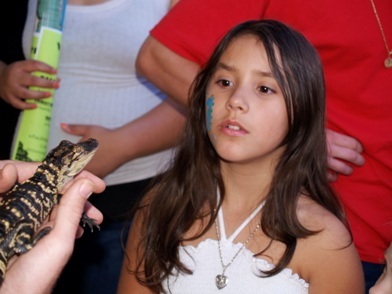 Some children got "up close and personal" with wildlife. Maybe a little too up-close. 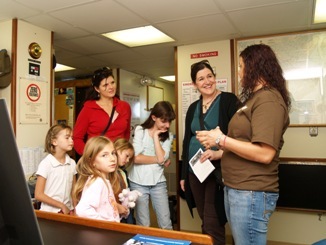 Organizations such as the Georgia Department of Natural Resources, The Dolphin Project and the Georgia Sea Turtle Center were on-hand to present, information, displays and activities. 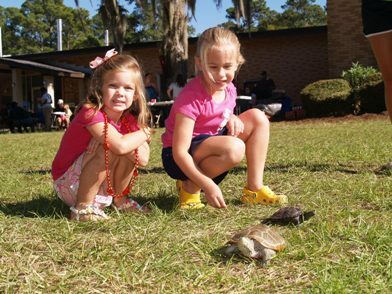 The Diamond Terrapin Project brought some of their subjects, which were a big hit with the younger set. Kids prepare their model plankton for the Plankton Sink-Off. The Plankton Sink Off is a race to see who can get to the bottom of the tank last. 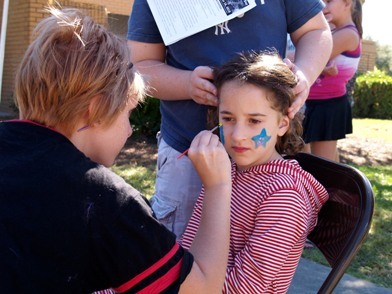 And what would a festival be without some face painting. We have a much larger photo gallery on the Skidaway Institute Web site. Where: Skidaway Institute of Oceanography, Skidaway Island, Savannah, Ga. 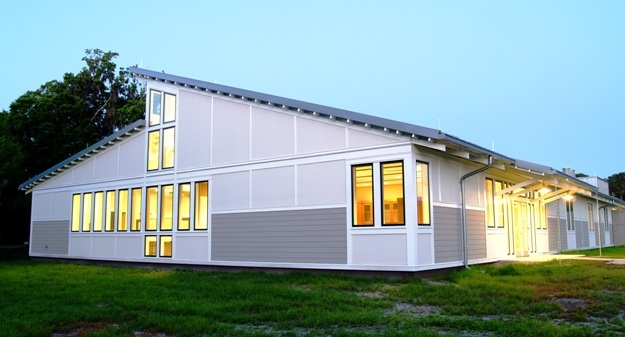 The Savannah Branch of the U.S. Green Building Council (USGBC) will present a LEED® Gold Certification plaque to the Marine and Coastal Science Research and Instructional Center (MCSRIC) at Skidaway Institute of Oceanography on Tuesday, October 19, at 6 p.m. Immediately following Choate Construction Company will sponsor the inaugural event for the USGBC GA Savannah Branch Emerging Professionals Committee. Appetizers and beverages will be available. The event is free and the public is encouraged to attend.